Ryan Gravel, a senior urban designer with Perkins+Will who has helped to lead the design of the Atlanta BeltLine, spoke at an event hosted by the Centre for City Ecology and Toronto Park People this week. Ryan shared the beginnings of the Atlanta BeltLine — how his year abroad in Paris inspired him to develop a proposal to transform his hometown of Atlanta into the kind of city he wanted to live in. The result was Ryan’s 1999 masters thesis: a proposal to connect a 22-mile loop of former railroad corridors in downtown Atlanta into a multi-use network of transit, cycling, and pedestrian trails. The loop would connect 40 diverse neighbourhoods and spark local economic development, community development, affordable housing, and public health benefits. Ryan’s thesis idea hatched the Atlanta BeltLine, one of the largest and most comprehensive public works projects underway in North America today. The BeltLine is a model for how underutilized infrastructure corridors can find new life as critical urban connectors. 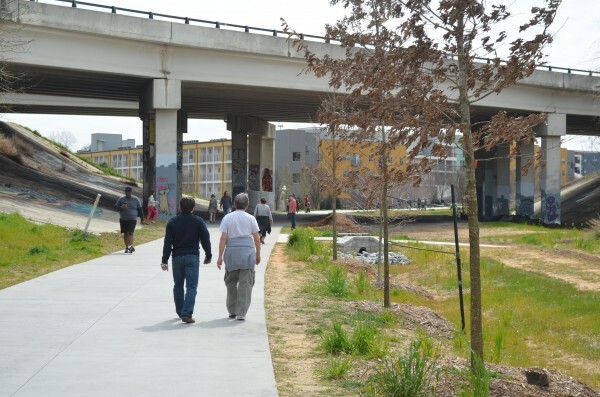 By incorporating public health, urban design, economic development, and environmental considerations holistically, the BeltLine is more than physical infrastructure, it is shaping a new way of life in Atlanta. Ryan sat down with Claire Nelischer of the Centre for City Ecology and Anna Hill of Toronto Park People to speak about the potential of catalyst infrastructure to shift cultural expectations of the city and how to build consensus and connections around corridor projects. Anna Hill (AH): You’re here in Toronto this week to attend the World Congress on Design and Health. It’s fantastic that public health professionals are starting to think about planning issues as falling under their purview. Ryan Gravel (RG): The challenge is that [planners and public health professionals are] speaking a completely different language. So translating between planner speak and public health speak is challenging but important… In the states, the protection of public health is the legal basis for our regulatory environment, and the investments we make in transportation should theoretically support the welfare of the public. So you could argue right now that we’re spending lots of money doing things that are not in the public interest. Getting to that point, culturally and politically, we’re a ways off. But having that conversation is interesting. Claire Nelischer (CN): The Atlanta BeltLine project is incredibly comprehensive – incorporating transit, green space, affordable housing, and economic development. How important do you think this kind of comprehensive systems thinking is to the creation of new greenways today? RG: There’s a lot of these projects emerging, and some are simple greenways. But I think the ones that take those aspects [of transit, open space, housing, and economic development] on as part of the package seem to be more compelling and capture the imagination of the public. When you can make that kind of compelling argument, like with the BeltLine, it makes people engage with the idea and sets the expectation high for the elected officials implementing it. It obligates them to think of all these things when they make decisions…When you can tell the full story, you can make it more interesting to the decision-makers. CN: You often speak about catalyst infrastructure projects. In your words, what constitutes catalyst infrastructure? RG: What I find fascinating is not just infrastructure, but the fact that it catalyzes change. A public investment would catalyze a private sector response. It happened in the old days with the streetcars that came out of the downtown and catalyzed new neighbourhoods — this was an infrastructure investment that catalyzed a market response, and that market response created a particular physical environment that enabled a particular kind of lifestyle. In exactly the same way, the [public] investments in highways catalyzed a change that caused the private market to respond and create something different. What I’m interested in is creating these interventions that catalyze not only physical change in communities but also a way of thinking about that place and a way of life for the people that live there…We can pitch all the ideas that we want, but what we really need is a cultural perspective that values those things and that will then vote for them. And to get to that kind of different cultural and political perspective, we need a much larger change than just some physical projects. CN: Cultural expectations about how a city should look and operate can prevent us from pursuing new urban forms that could promote healthier, more connected and more vibrant cities. How can we begin to shift these cultural expectations of our cities and envision something new? RG: Innovative projects catalyze a new kind of thinking and start a new cycle — it’s not just that the physical environment shapes our cultural perspectives, but also that our cultural perspectives shape the kind of infrastructure that we build. We need to have these interruptions [like catalyst infrastructure projects] to change that cycle. AH: Building grassroots support at an early stage was critical to the success of the BeltLine. How do you go about building support for a project this large and comprehensive in such diverse communities? Do you highlight the localized benefits or prompt communities to buy into the cohesive vision? RG: On the BeltLine, we did both — this is something that’s great for you and your community, but you’re part of something bigger. I think that there was a metaphoric quality to the loop shape of the BeltLine: we’re all in this together, and there’s something special about that. People like that notion and it tied us all together around downtown. There are communities in Atlanta that are very different from a socio-economic perspective but physically, in terms of urban fabric, are very similar, and this tied all those places together….You’re taking this thing that is a barrier between communities and making it a meeting ground. You’re not only tying communities together along the line but across the tracks. In Atlanta, a city with a history of racial segregation, there is a poetic quality about this loop formation and the erasure of that barrier. AH: And in terms of drumming up political support, how do you achieve support from politicians representing the unique needs of different constituencies? This is a key question here in Toronto, where councillors represent individual wards but where greenway projects often span multiple wards. RG: I think that’s part of the benefit of doing something big, bold, and visionary. We started with a core project about transportation and the vision expanded well beyond what we imagined in the beginning. The bigger it got, the easier it got, because you had more constituents wanting the same things. CN: Any urban revitalization project precipitates a fear of gentrification and displacement. What advice would you have for other catalyst infrastructure projects in addressing this issue? RG: It’s a financial problem. The answer cannot be to not provide greenways and parks and transit and grocery stores. It’s just not okay…The problem is not that it becomes a desirable place to live; the problem is that the people who live there can’t afford to stay, and that’s a financial problem. In my mind, the answer has to be a financial solution. AH: Historically, urban infrastructure that fostered connectivity brought about new waves of development. First, waterways, then railways, then highways, then subways. Do you see greenways as the connectors that will spark the next wave of urban development? RG: I don’t think it has to be a greenway per se, but it’s a way of adapting infrastructure that is currently obsolete or underutilized as a corridor. The Green Line in Toronto is a great example — there’s no reason why it can’t maintain its current function, but it can accommodate and do a lot more than what it’s doing now…The demand of people repopulating cities is forcing people to re-think the utility of those corridors and add productive use to them. AH: From what you’ve seen and heard during your time in Toronto, what do you think are Toronto’s most promising arteries for transformation into multi-use catalyst infrastructure projects? RG: What many of the more compelling projects have in common is a really compelling story. It’s more than just infrastructure, it’s a whole story about what kind of place you want to be when you grow up. The ravines seem to be a great story in Toronto. They serve a whole watershed and they drain into the lake, so the city is here for a reason, and it’s built in that particular spot between those spaces for a reason…The story in Atlanta: parts of it are things we say, and parts of it are things people just know, like that the railroads were barriers between places of different class and race makeup. And there’s a beauty to that. And that is a reason that people love it — it connects us not just to a physical place but to a cultural experience in a way that is profound. So understanding the communities along the way in the city is important…These projects are never people coming from the outside without knowing the place. They are all growing organically from inside…People from the outside can help to develop ideas and shape ideas, but it has to come from within. Because you’re the people who are walking these streets everyday and living it.